Thousands descended on Independence Mall on Thursday to partake in the annual Wawa Hoagie Day celebration, where six tons - a two mile stretch of hoagie - was served to hungry visitors for free. 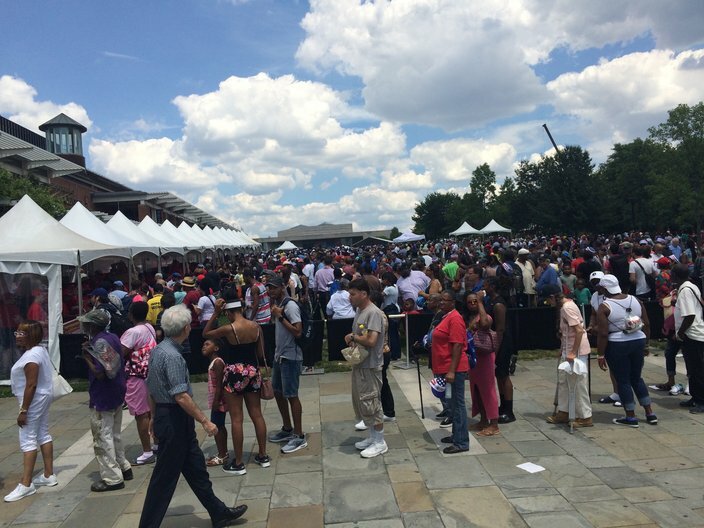 Thousands descended on Independence Mall on Thursday for the traditional kickoff to Wawa's Welcome America celebration, which runs through the July Fourth holiday. 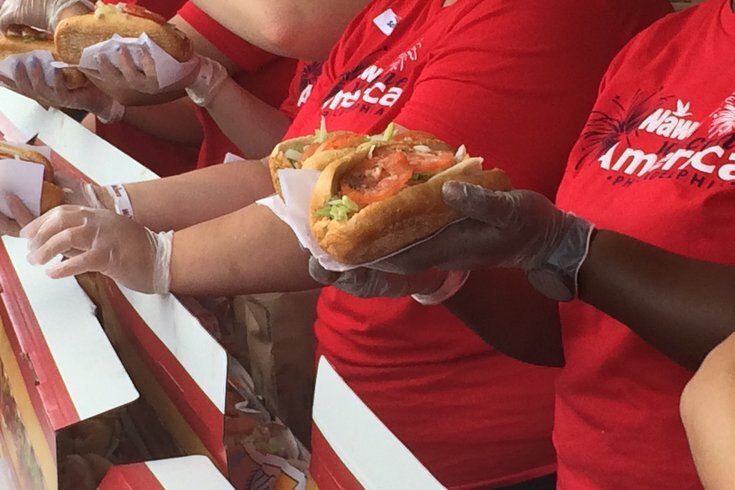 To mark the 24th annual Wawa Hoagie Day, the convenience store chain produced a six-ton, two-mile-long Italian hoagie – in reality, 23,000 individual "Shorti" hoagies – and served it for free to patrons during the afternoon event. The event also served to highlight a more serious hunger problem in the city. According to Chris Gheysens, Wawa president and CEO, the first 5,000 hoagies assembled for the event were donated to Philabundance, a local food-rescue organization that works to support those who go hungry in the Greater Philadelphia area. Another 1,000 hoagies were donated to local veterans through Philly celebrity chef Robert Irvine. According to Wawa, the hoagie was large enough to feed 20,000 people. Lines stretched throughout Independence Mall as thousands waited for their bite of a Wawa hoagie during Hoagie Day. The event has grown significantly since Hoagie Day's origins in 1992, when the sandwich stretched all of 500 feet long, Gheysens said. By contrast, the one shared Thursday would stretch for more than two miles, if each Shorti was laid end to end. With a mouthful of hoagie and a smile on her face, Cindy Vile, 51, of Quakertown, Bucks County – one of the very first to get a hoagie on Thursday – said her family has made a tradition of celebrating Hoagie Day. "This has been a family tradition of ours for the last five years," she said. "I wouldn't miss this for anything. We love Wawa." As lines stretched through Independence Mall, next to the Constitution Center at 5th and Market Streets, Preston Elliot of the WMMR radio show "Preston and Steve" entertained the crowd and led the annual Hoagies for Heroes contest. The annual face-off pits teams of Philadelphia firefighters against city police officers, while members of the Pennsylvania Air Force National Guard took on members of the Army National Guard, in a contest to make as many hoagies as they can in the span of three minutes. 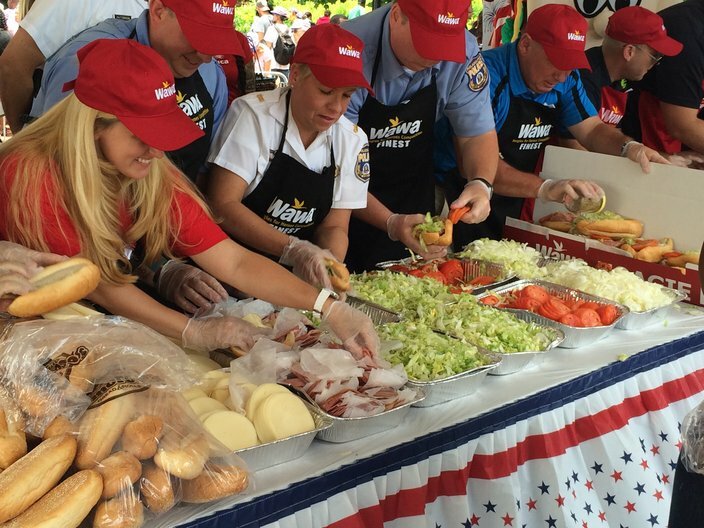 Before the hoagie-making competition got underway, however, police and fire officials took turns sparring in a war of words. The Philadelphia Police team worked hard to compete in the annual Hoagies for Heroes contest, which they had won for six years in a row. "Can I start trash talking now?" asked Jesse A. Wilson, deputy commissioner of operations for the fire department. "The Fire Department floats like a butterfly and makes hoagies like a bee. And, this is the thrilla in Philla!" Philadelphia police Deputy Commissioner Myron Patterson attempted to cool the firefighters' heated rhetoric by reminding Wilson that the police team had beaten the firefighters for the past six years running. He even reminded the officers that during last year's competition Wawa employees had to help the Fire Department team complete the contest. "We will take no mercy on them today," promised Patterson. 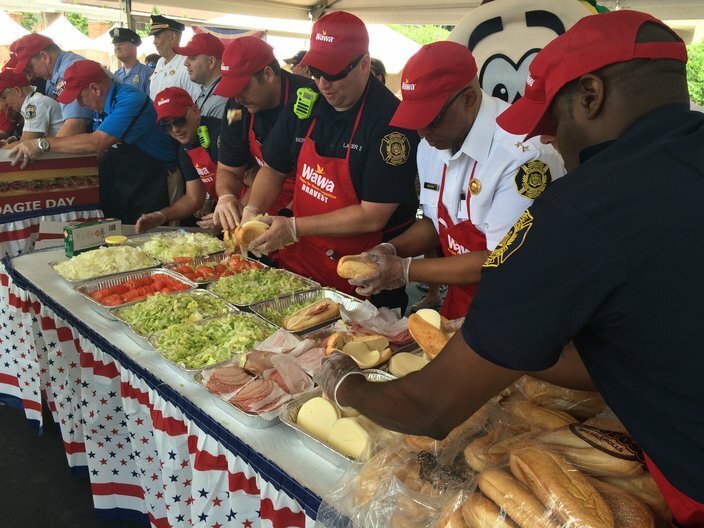 But, Patterson was eating his words – along with a side of hoagie – after the Fire Department team, made up of members of Center City's Ladder 2, beat the officers from Mayfair's 2nd district, 46 sandwiches to 39 sandwiches. In the other contest, the Air Force team dominated, building 66 sandwiches – 18 more than their Army counterparts. Each team raised $3,000 for a variety of charities. Members of the Fire Department's hoagie making team rush to win the annual Hoagies for Heroes contest. The Fire Department beat a team of police officers by a score of 46 to 39. Irvine, who served as a judge for the contest – and refused to count sub-par subs in each team's final tally – said that while everyone was gathered for a taste of free hoagie on the bright, sunny day, the event was about much more than sandwiches. "[People say] Hoagie Day is about sandwiches. It's not folks," said the chef. "It's great people meeting great people and giving love. Even if it might be through 10 inches of bread in a sandwich." As he bit into a hoagie during his first Hoagie Day, Justin Thomas, 30, of Northeast Philadelphia, said he was glad to join in the celebration – and not just for the free food. "This is my first time here and it's great," he said. "It's so much fun to be a part of the community like this."